But basting was the far as I got with this 'monster'! seams, and am now back to square one! add that to the task tomorrow, as well as a different backing! I'm thinking of adding them to my Chuck Nohara blocks? 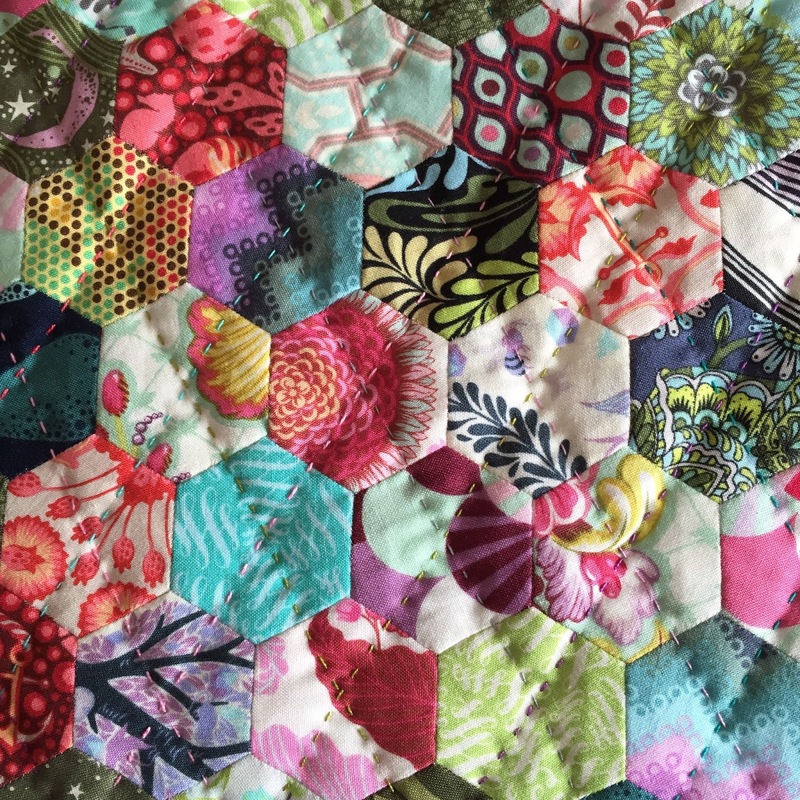 It's hard to go wrong with Tula Pink and hexies! shame I got those magpies upside down! I hope your basting adventure attempt #2 will be more succesfull! Love those Chuck Nohara blocks and the idea of the nine patches! Uou have such fabulous yellow fabrics! Love those hexies! That's a gorgeous pillow!! Sorry to hear about your trials basting that quilt. Hopefully a fresh start will see you through. Good luck! Your quilt backing/basting sounds very frustrating! Good luck on the second try!! 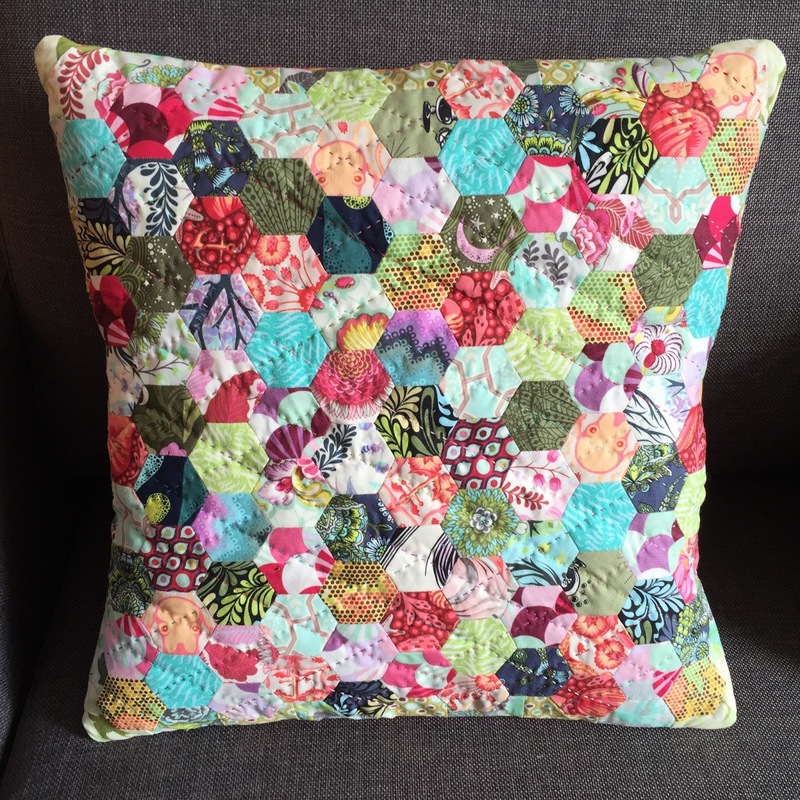 Your hexie pillow looks awesome tho - just beautiful! I love that cushion! Hope the quilting goes better this time round - good luck! Hope the basting goes better today! 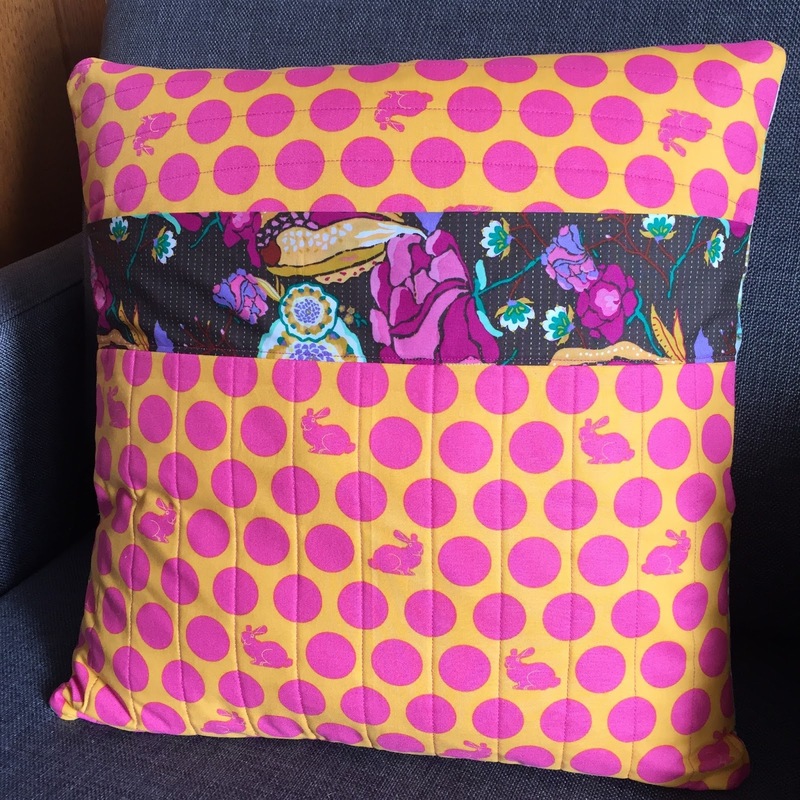 Love the look of your large quilt, very vintage-y! And that yellow flower print in your 9patches is gorgeous isn't it? 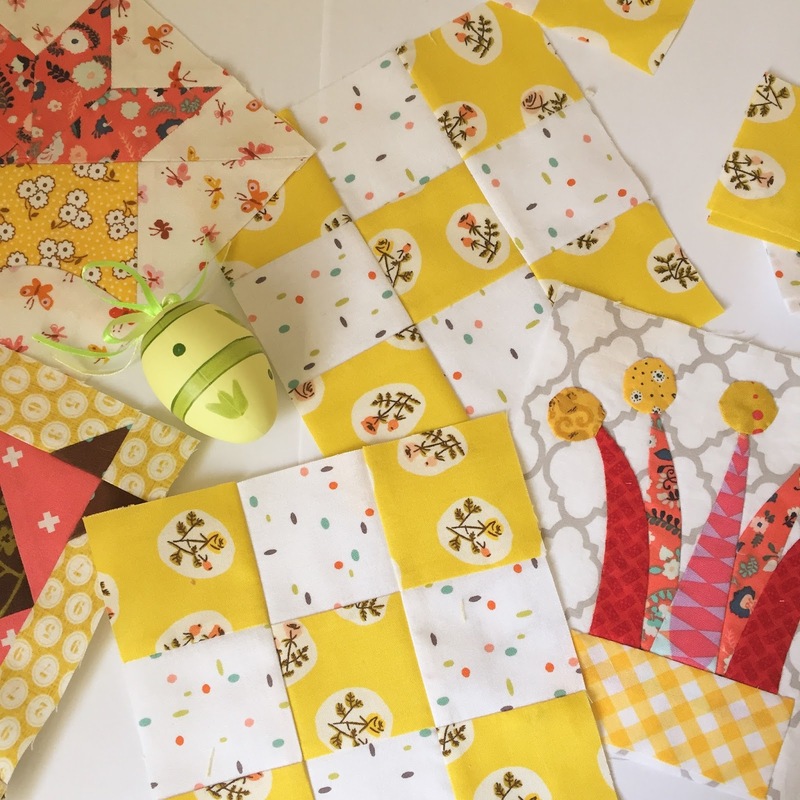 I don't think anyone enjoys basting, spray glue is my best friend when basting :) I love those yellow 9 patch, they would work really nicely with your Chuck Nohara blocks, and the Tula Pink spot is clever, I almost didn't spot those rabbits hiding in amongst the spots. Basting quilts is my least favourite task, good luck with your next attempt. 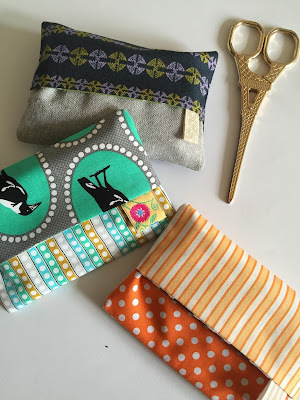 You've been making lots of pretty things!! 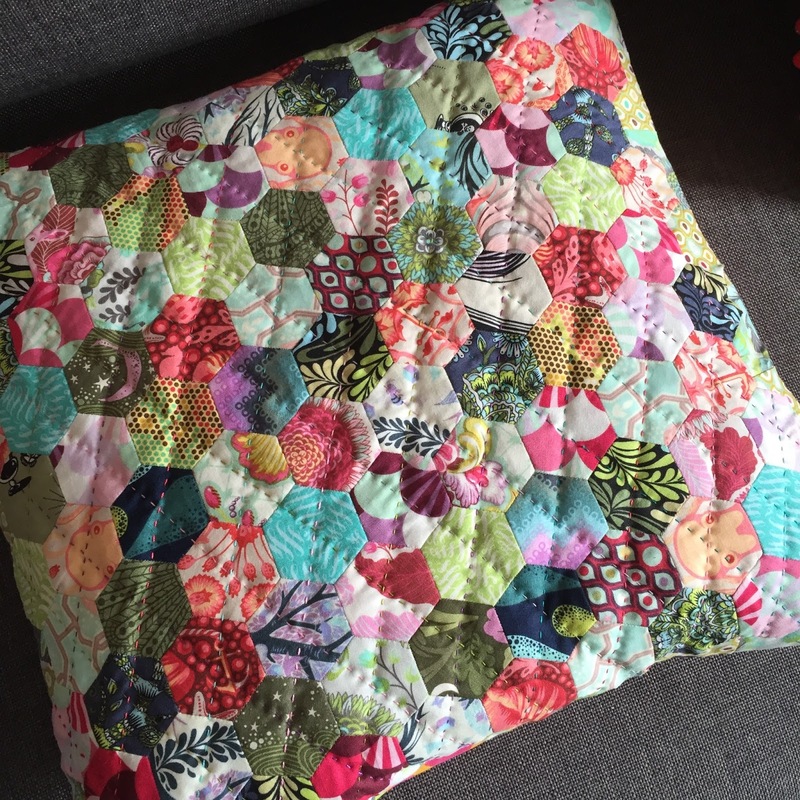 Love the hand quilting on your cushion. It's sooo frustrating when something doesn't go well. It can bring your the momentum to a grinding halt. Your quilt is so cheerful though it will work out eventually and be beautiful. Sometimes it's just best to switch to another project for awhile. That way something moves forward even if it's not what we set out to do. Oh that pillow! I just love it. The quilting thing sounds frustrating, especially when you're almost done and you have to start taking it apart. I've run into problems before with vintage sheets. They're so pretty but can be fussy. Polyester batting is not a girls best friend - I am a staunch cotton supporter for this exact reason. 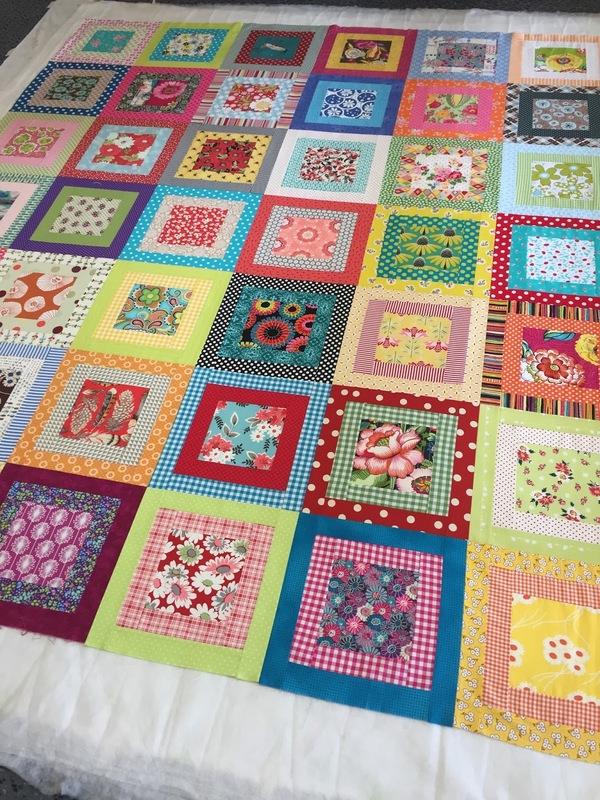 Although I love that quilt top - lots of fun fabrics, and nice and vintagy looking. You have been busy Susan! Sorry to hear you had a problem with your quilt layers. I'm guessing that vintage sheet might have had some polyester in it. Or, my other go-to problem is usually taping the backing down well. Lots of tape, with very little of the raw edges of the backing showing. Also, I'm a fiend for over-pinning. You can never have too many pins holding a quilt top together, in my opinion. Just think. You're moving the whole thing to a sewing machine to quilt. Makes you want to use a lot of pins! It's a darling quilt top. I hope it comes together now. As for the pillow, it's great! You're a speedy hand quilter! I'm impressed with what you manage to accomplish while working full time! Ugh, basting! Not fun at all! Best of luck. I love the Chuck Nohara blocks! Just fabulous! Love that pillow. I am thinking the polyester backing might be the culprit. The one and only time I used it, I had to re-baste my quilt 3 times before I was happy with it. The cushion is fabulous Susan and I love your yellow nine patches. I think they will look great in your Chuck quilt. how did you go with your basting? That is so frustrating to have to battle with the basting like that. I do hope that sorts out for you. Love the finish with the hexie cushion. That looks great. Glad you had some easier sewing with the 9 patches and the tissue covers.